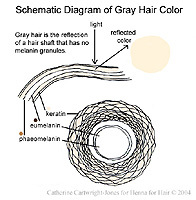 You can henna your gray hair and get beautiful results ... without chemicals! 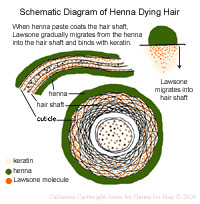 How does henna dye hair? Your gray hair is special. 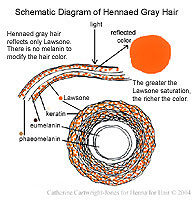 Henna on gray hair is orange. Darken the henna to black. Darken the henna to brown. 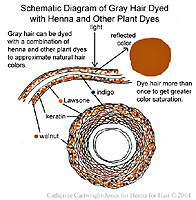 Once upon a time, plant dyes were the only hair dyes. 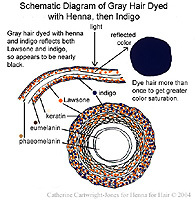 Henna and indigo were the most effective, safest, and most commonly used hair dyes, and people used them as early as 6000 BCE. These were used across North Africa, the Middle East and South Asia. The exact mixes were kept in oral tradition within families or small businesses in those countries. They were rarely used in Europe, because the plants don't grow in Europe. Plant dyes are more difficult to mix and use than synthetic dyes, and learning to use them is an art as well as a science. Be patient. Try stuff. Have fun!